Getting to McCrady’s Tavern requires that one head down an unassuming, narrow alleyway. It’s just the kind of place where you’d expect Harry Potter to stumble upon the entrance to Diagon Alley. And while there were occasional moments of wizardry while at said tavern, this is less a sorcerer’s tale than a late-70s rock ballad — fitting considering the latter is the restaurant’s veritable soundtrack. How’s that song go again? 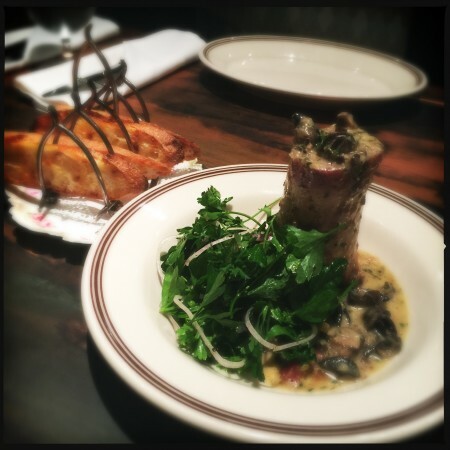 Chef Sean Brock’s escargot-stuffed marrow bone with grilled bread and parsley ($15) may be one of the more intimidating-sounding options on both the lunch and dinner menus (the calf’s head soup is the likely victor), but it’s also outstanding. The marrow adds a rich element usually provided by butter, and there’s the lingering taste of tarragon at the finish. It’s elegant and unabashedly French in a way the French never even conceived. The bright flavors of parsley and paper-thin red onion contrast with the earthy richness and perfectly balance each bite. It’s incredible. And arguably genius. A chunk of femur never held such allure. Clapping his hands together in glee, on one visit my friendly and enthusiastic waiter was delighted to help me pick from the menu. Flying high on his first recommendation, the foie gras and chicken liver parfait ($15) soon arrived in a small, silver, presumably-tongue-in-cheek can. It’s a good thing I don’t work in the service industry as I’m not sure I’d be able to control the urge to sing, “Meow, meow, meow, meow…” while popping this dish’s top. Granted, it’s more Fancy Feast than Meow Mix, but damn if at first glance the parfait doesn’t look like a special treat for Mittens. Inside, the smooth-as-silk pâté parfait is topped with a muscadine grape gelee, but it was so bitter I felt compelled to send concerned word (and half the tin) back to the chef. Maybe it was a new batch and no one realized the “sweet gelee” we kept hearing about had gone disagreeably rogue? Alas, apparently ‘so bitter it leaves an acrid taste in your mouth’ is the new sweet. “Did you eat the gelee by itself?” My waiter probed. “You’re not supposed to eat it alone,” he responded. The crispy veal blanquette ($32), however? Straight out of your Oktoberfest dreams. Typically a French stew in which all of the components are intentionally kept pale, the McCrady’s version finds a breaded, plate-sized cutlet smothered in a rich, simple cream sauce laced with mushroom slices, ham chunks, and green peas. Crisply fried and served with a sprinkle of parsley and a half-lemon, this schnitzel-esque version is at once homey and refined. The updated McCrady’s space is largely the same as before. The same high ceilings and exposed stone have been joined by new booths with copper-topped tables. It’s the formality that’s been removed, although not necessarily from the service. One imagines the noise level could get raucous with a full house, but the long wood bar by the entrance remained relatively empty during both of my visits. Scanning the lunch menu, it seems the tavern salad ($13; $18 with shrimp or chicken) doesn’t need to explain itself. 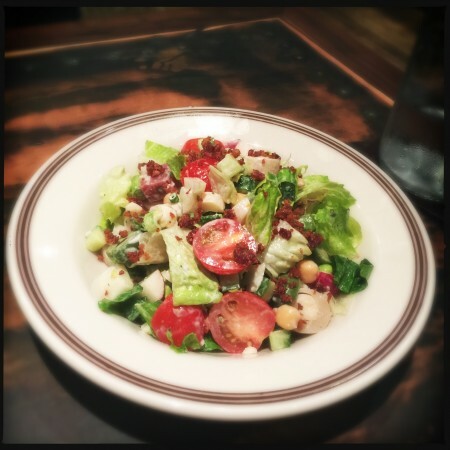 It’s an unconventional mix resplendent with romaine, quartered radishes, marinated hearts of palm, green olives, cucumbers, bacon, green onions, garbanzo beans, halved cherry tomatoes, and cubes of salami. Needless to say, there’s a lot going on and not all the ingredients play well together. Some bites bordered on magic, others, not so much. Less unpredictable, the roast chicken with chicory and pan jus ($16) is served skin-on and somewhat bone-in, fitting for the upscale homestyle vibe of the dish. 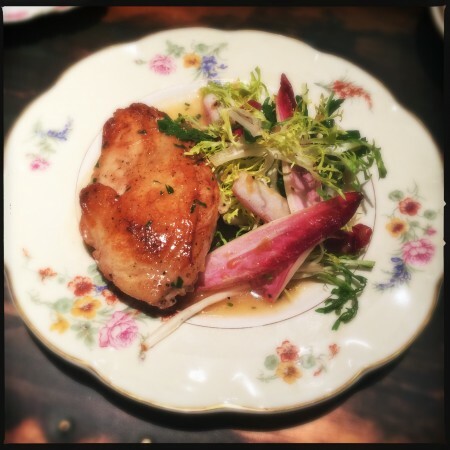 The small, tender breast and lightly-flavored au jus are deceptively simple, but matched with the accompanying frisée and radicchio salad, the quiet elegance of the preparation shines through. Regarding the steak frites, look, here’s the thing: You can’t call a dish steak frites and then send out something that’s not steak frites. Well, I mean you can, but, why? Maybe call it ‘Steak home frites’ or ‘Steak duck fat potato wedges.’ I’m not saying the potato part wasn’t decadent, but it wasn’t what I was expecting, and I lead a cushy enough life that the switcheroo was disappointing. Have no fear, though. The five, juicy slices of perfectly cooked meat and accompanying gravy quickly wiped off my frown and replaced it with question marks. 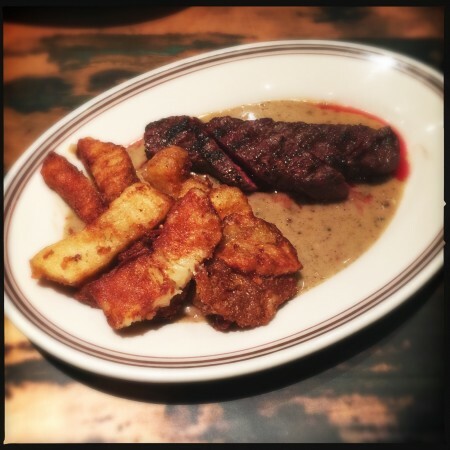 Where the steak was divine, the accompanying sauce is as aggressive as the music overhead. It’s not everyday you get a mouthful of piney evergreen juniper berries with a hot black pepper chaser. It may turn out you love this taste sensation. If so, you won’t mind that the fries are languishing in a deep pool of it. As for me and my taste buds, I’d highly recommend asking that the fierce gravy be placed off to the side. On the other end of the pepper sauce spectrum lies the beet au poivre ($11). If only it were vegetarian, it evokes a filet to the degree I might consider a return to my old tree-hugging ways. Dehydrated, reconstituted with beef stock, and cooked on the grill, this surprising concoction puts faux meats to shame. Served on a luxuriant black pepper sauce, topped with blue cheese and accompanied by a bright mix of watercress and parsley, this hearty beet “salad” is a creative revelation. An apparent believer in the old rock adage that anything worth doing is worth overdoing, the new McCrady’s Tavern contains some hits and some B-sides. The great divide between French restraint and American excess is clearly fraught with peril, but with this singular combination of product, talent, and exuberant creativity, great music — if not magic — can no doubt be made.